St Mary’s Salesian is a strong, family oriented community football club based at Ferndale Park in Glen Iris. The club plays in the Victorian Amateur Football Association (VAFA) where all players play for the love of the game. We were a foundation club in the inaugural VAFA Women’s League which commenced in 2017. 2018 and 2017 have been two wonderful years for Women’s Football at our club, with the successful introduction of two women’s teams (seniors and reserves), Senior Women’s Premierships in both years, and a Preliminary Final appearance for our Reserves in 2018. We will be fielding two women’s teams in 2019 (Seniors and Reserves) who will compete at the highest level in William Buck Premier A, backed up with a thirds team which means all our players are able to play at a level that best suits them. We will be one of only eight clubs to compete in Premier A in 2019, joining Melbourne University WFC, Marcellin, Kew, Fitzroy-ACU, SKOB Saints, Old Trinity and West Brunswick. In addition to our two women’s teams, we also field three open-age men’s team and an U/19 team, with our seniors playing in D1 in 2019. St Mary’s Salesian has a strong and stable voluntary committee, and is financially stable. We are a very respected club in the VAFA both on and off the field. Choosing St Mary’s Salesian is a great choice – you will have a lot of fun both on and off the field. Our club is a very good fit for players of all ages looking to play Women’s football in 2019 (and beyond). Our playing ranges from those who have played before to those who are new to the game. We have two very experienced coaches, Damian Sutherland and Simon Brownhill, and their coaching philosophy highlights both skills development and fitness. We encourage each player to develop and to strive to be the best they can, no matter their skill level. 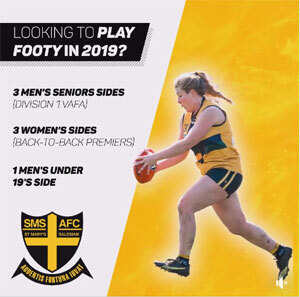 As one of the few clubs in the VAFA Women’s Competition that has two teams, backed up with a thirds structure, all our players are able to play at a level that best suits them. It also ensures that you will get a game each week. We are well placed to provide players from other sports the opportunity to transition to football and develop their AFL skills to a high level. Looking back at season 2017 we had a small number of players who had played AFL before, but the majority were new to AFL and had a background in other sports – netball, soccer, hockey being the main ones. We were able to develop the AFL skills of our players to a level where we won a Premiership in Division 1 in our first season with a team mainly composed of players from other sports who were new to AFL backed up by a core group who had played before. A similar story in 2018 when we experienced a further influx of new players with a background in other sports. 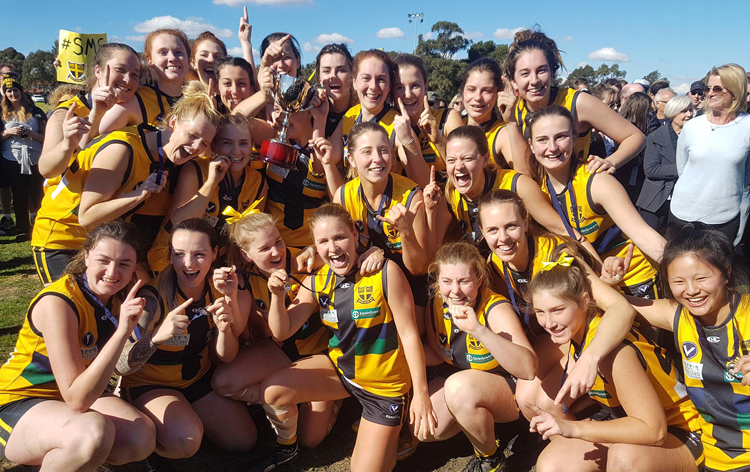 Our senior women’s team won their second premiership and our reserves played in a preliminary final. Our 2018 Premiership side and our Reserves Preliminary Final sides both contained many first year players. We are a very good destination club for players who are looking for a pathway into higher level Women’s Football. In 2017 one of our players, Pip Peschke, was recruited to the Box Hill Hawks in the VFLW and ended up finishing 3rd in their Best and Fairest. In 2018 another of our players, Lisa Davie, was recruited to Richmond VFLW and also finished third in their Best and Fairest. We also host players who are listed with VFLW teams: Bec Grant at Collingwood and Sarah Yule at Hawthorn. Two of our players, Lisa Davie and Tash Rappos both played in the first-ever VAFA Women’s Big V Representative side, which defeated AFL Goldfields by 49 points in North Ballarat on Sunday July 9. In 2019, our reigning Best & Fairest winner Ruby Svarc was recruited to Essendon in the VFLW, with another four players also listed at VFLW clubs: Pip Pecshke (Hawthorn), Lisa Davie (Richmond), Bec Grant (Collingwood) and Kat Newton (Collingwood). You will be joining a very welcoming and inclusive club which will provide you with the social environment for you to make new and lifelong friends. Ours is a young playing list, and our players come from a diverse range of junior backgrounds. We have roughly equal numbers of women’s and men’s players, and they are around the same age group which enables us to successfully operate in a one-club environment where all players from all teams participate equally in the life of the club. All our club functions are attended equally by players from all teams, and are attended by both our male and female players and supporters. You’ll have a lot to look forward to at St Mary’s Salesian with a packed social calendar including: Cruises, Annual Balls & House party styled events. CLICK HERE to register your interest in joining us as a player.